A resort town for Rome's rich and famous for over 2,000 years, Tivoli is today a fascinating refuge for anyone interested in history and culture. This guided day trip from Rome transports you to Tivoli on a comfortable air-conditioned bus and deposits you smack in the center of thousands of years of history. 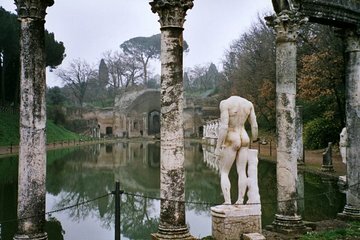 Take a guided walking tour of Hadrian's Villa, a lavish palace where the Roman emperor officially moved in 128 A.D. Marvel at the ruins of temples and theaters, swimming pools and steam rooms. With a guide at your side, learn about what daily life at the villa was like nearly 2,000 years ago. After touring the ancient estate, indulge in a delicious Roman lunch at a local restaurant and then get acquainted with the opulent Villa d'Este, an erstwhile Benedictine convent that was turned into a Renaissance palace by Cardinal Ippolito II d'Este, son of Lucrezia Borgia. Wander through the palace's verdant, highly manicured gardens and take delight in the famed Fountain of Neptune. After touring the villa, hop back on the bus for the return back to Rome. Our guide,Jo, was knowledgeable about all aspects if the ruins. The group size of 20 was just right for this trip. Lunch at a charming restaurant in Tivoli was the perfect entry for our Villa d'este visit. Our day for Tivoli started out with a great drive out of Rome and into the countryside. The Hadrian's Villa was much more than we expected plus the fountains at the Villa d'Este were the highlight of the day! We thoroughly enjoyed the lunch which gave us a chance to talk with others enjoying the tour! This tour was not worth the money. If you have seen Pompeii and the Roman Forum, this is the same. The lunch was mediocre but had good wine. The tour guide was pleasant and friendly but hard to understand and went off topic a lot. I also am not one to be engaged in conversation, just want to listen and observe. She did not let this happen and would call you out if not paying attention and answering her questions. Our guide was great the ruins where ok as ruins go. A lot of walking we thought at that point it was a 3 or 4 star tour. BUT THEN we saw the fountains, TAKE THIS TOUR the fountains where amazing. Lunch was worth it, very good. Small group tour of six. Very friendly and knowledgeable guide. Reasonable pace but a lot of walking. You have to be able to climb a lot of steps at the Villa d’Este. Lunch was superb and included wine. Guide did not rush us but moved at our pace. Small six passenger van was clean but a/c needed work. Overall an excellent tour. A must see! If you have some extra time I highly recommend this is a place to see and explore. Simply beautiful! Our guide, Pamela, was very knowledgeable about both sites we went to. The lunch provided was quite good. The size of Hadrian's Villa is astounding. And the fountains at the Villa d'Este are breathtaking. This was a great tour-so glad i added it to my itinerary. The only negative and it is a big one, is that the lunch was totally inedible-no one ate it--better off serving pizza! !